More than 700,000 undocumented Afghans have returned from Iran this year as the Iranian economy tightens, with a knock-on effect on the Afghan economy, according to data from the U.N.’s migration agency. In a report covering the period up to Dec. 1, the International Organization for Migration said a total of 752,325 Afghans had returned from Iran and Pakistan, including 721,633 from Iran. “Undocumented returns from Iran in particular are seeing a massive increase over previous years, largely driven by recent political and economic issues in Iran including massive currency devaluation,” the IOM report said. Demand for Afghan labor in Iran’s informal economy had drastically fallen, it added. 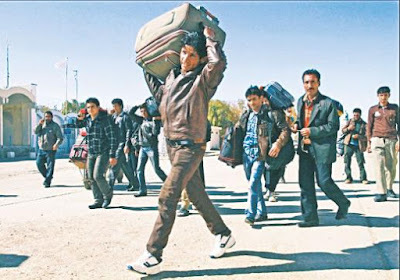 Iranian media reports say many of the Afghans had returned or were seeking to enter Turkey to reach Europe after the fall of the Iranian currency, which has lost about 70 percent of its value this year. Iran emerged in early 2016 from years of global sanctions under a deal with world powers that curbed its disputed nuclear program. But U.S. President Donald Trump withdrew the United States from the deal in May, calling it flawed to Iran’s advantage, and reimposed far-reaching U.S. sanctions in phases, with the most damaging oil and banking penalties taking effect on Nov. 5. Jan Egeland, head of the Norwegian Refugee Council, told Reuters that increasing U.S. pressure on Iran would cause problems for Afghanistan. “The Trump sanctions will put the Iranian economy into a void, and is doing that. (The people) who will first lose a grip on their existence are the Afghan registered and unregistered refugees and migrants,” he said. Last month the top U.N. humanitarian official in Afghanistan, Toby Lanzer, told reporters in Geneva that the U.N. had expected up to 700,000 Afghans to return from Pakistan this year, but very few had made the move, while the returns from Iran took the U.N. by surprise.